Perhaps the title should be: Why don't all fruits containing phenol residues go brown quickly when left in the fridge? Bananas go brown over time because of the oxidation of phenol residues. Bananas go brown quicker in the fridge than left at room temperature. This seems to contradict the first point since the reaction should be slower at colder temperatures. Dialogue from the naked scientists briefly explains why my line of thinking might be wrong. Emily: Well it’s a good question and the answer is that they will brown faster in the fridge. It’s mainly due to the formation of ice crystals, so if you put your banana in the fridge, the ice crystals grow, and they actually rupture the cells of the banana skin. 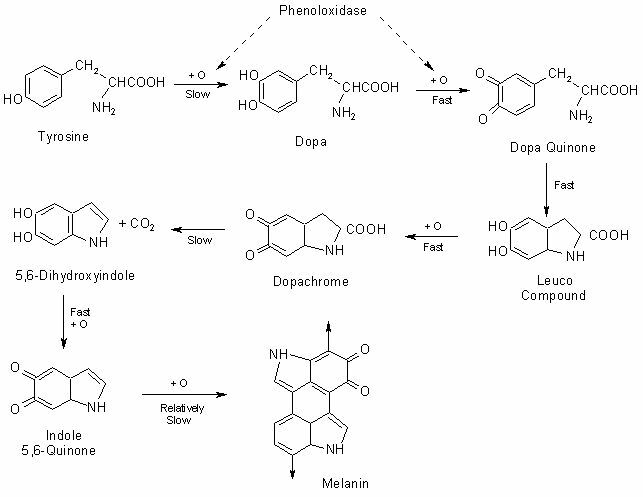 This releases an enzyme called polyphenol oxidase and as the name suggests it acts to oxygenate phenols, which have a ring-like structure, into quinones, and these quinones can then all join together or polymerise and produce a black, brown, or red pigment called polyphenol and this is what gives it the brown colour. So, if you have your banana in the fridge, this will occur and you'll get a brown banana. But another interesting thing about bananas is that if you have them in the fruit bowl, they'll release ethene and this will make the other fruits in the bowl ripen faster because it’s a ripening hormone. Chris: So, the question is though, if this is a chemical reaction making this brown pigment, if you slow down the reaction by lowering the temperature, then it should happen more slowly, therefore, going in the fridge should make the bananas go black slower? Emily: I can see why you're thinking that but actually, it’s more the rupturing of the cells. So if you have a banana on your table, the cells are going to be intact, the enzymes contained, and the reaction is not happening at all whereas if you put in the fridge, the enzyme is released and the reaction can happen – although yes, it might happen slower. At the risk of channeling people into a yes or no answer, could someone clarify for me if the following statement is true (maybe with a peer reviewed source which I've had no luck finding): bananas go brown quickly in the fridge because cell lysis caused by ice crystal formation at cold temperatures in the fridge, and this releases Polyphenol oxidase (PPO) freely causing more browning. This leads me to another seeming paradox: Why doesn't this rapid browning in cool temperatures happen for other fruits and vegetables? What is special about bananas? What's interesting with this one is we don't really know very well the mechanism behind what's called chilling injury. It happens to a range of fruits, like bananas, peaches, avocado, or apples. The belief is that the chilling alters membrane permeability to storage vacuoles inside the plant cells. Try On Food and Cooking, pp.269, and Puig et al. (2015) for references here. Fig A. An overview of what a PO might do. So the phenolic compounds leak out and PO goes to work catalyzing reactions that start building up the dark pigments associated with browning. Being said, I can't at this moment find a good paper that says "look, this is how the entire process happens," but I'll be attempting to read a little deeper into the matter. Not the answer you're looking for? Browse other questions tagged biochemistry cell-biology food or ask your own question.